You do not need to wait for a special occasion to express your love for your girlfriend, wife or partner. If you are madly in love with her and you want her to know how much she means to you, go ahead, express your feelings at anytime you want to. Here are the top 100 Love Quotes for her to help you with expressing your love and devotion. Remember, she is the one! We’ve made many lovely promises to each other. But the best ones still ricochet in my heart, waiting to be revealed when the time is due. Saying something romantic and sweet with picture is the easiest way in these modern days. Why not use this opportunity to send these loving quotes to her straight from your heart using social networks such as Pintrest or Facebook. We know one thing, she will love it! The weird sun-kissed Instagram hues are nothing strange to me. My life is already engrossed in the rosy tints since the day we married. Thank you. The essence of marriage bliss, an epitome of romance, and the pinnacle of commitment is the embodiment of our love life. I love you. You are, not a mere mother of my kids, but the beat of my soul. You are, not a mere queen of my family, but the woman of my choice. I love you. Baby, your love is like a lamp in my window that guides me through the darkest night, I love you! I will love you more and more each day with every beat of my heart, until the day I die and my heart stops beating. I love you honey. Wishing nothing but love in her life, will definitely make her day. This is romantic way to make someones day better and of course yours too. 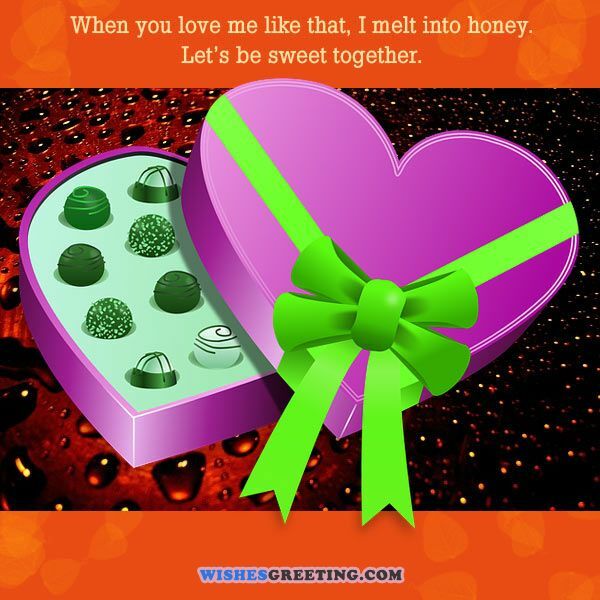 Using these love quotes full of finest emotions will share joy and warmth in her heart. And when you think about it, it is all because of how you feel for her. It doesn’t bother us how many years pass by, our love’s flight will always fly high. You’ve made my inadequacies seem perfect, all my shortcomings now seem complete. I can’t comprehend how much to thank you. But I promise, never will I stop trying. Fights and arguments. Hugs and kisses, ups and downs, frown and smiles. We’ll navigate through it together, not just once, but forever. Your sweet love is my inspiration, for without you I just cannot imagine how my life would be like. I am so happy that God gave me someone as special as you, I love you! I wish there would be eight days in a week and 25 hours in a day. That way, I can spend more time with you each day. I love you sweety, I can never get enough of you. In fact, I miss you already. Love is a miracle that happens inside the heart. Such miracle happened to me too, for I have fallen in love with her the moment I saw her, I love her so much! They say if you want to be effective keep it short. Exactly these wishes of romance are written in that way, to deliver a short but loving messages to girlfriend, wife or just a crush that you have. Why not spice up the love with some fun. You must admit ti, love alone is not something that without ingredient of fun last that long. That is why we have prepared these funny love messages for her that might be sent by you 🙂 Share them on Pinterest or Faceboook and get that loving smile on her face. One day I have caught myself smiling just for no reason at all. I thought I have gone crazy, but then I realized… it’s all because I was thinking of you. I believe that each and every love story is beautiful, but of all these, ours is my favorite. Every time you smile, you brighten up my day with your sweet laugh more than the sun could ever do. There are so many reasons out there to love you every single day. Your sweet laughter, your cute smile, your innocence, not to mention your kind heart. All these makes me want to love you even more. I love each and every moment that I spent with you. Your love has truly touched my heart in more ways than you can imagine. Hugging you is my favorite pastime, but kissing you is my most favorite thing to do. Before, I was so lost and lonely. Then you came along and finally, I feel like I’m home. Thank you for coming into my life, I finally found my way to life. No one should underestimate the power of your smile, as it’s the only thing that can touch my soul and melt my heart. You will surely fit perfectly snug within my arms until eternity my love. I will walk with you and follow you until the end of time. Just like other humans, you are not perfect I know. But to me, you are already perfect and that’s all that matters. I have waited for a long time for that perfect girl to come. Surely, my patience has paid off. Thank you for coming to my life, my love. There are times when I need to pinch myself whenever I see you beside me. I still can’t believe that my dream has finally come true and that is to have you. Before I have met you, I never know how it feels to look at someone and just smile for no reason. If I can give you something in life, then it would be the ability to be able to see yourself through my eyes, because only then will you realize how special you actually are to me. Here you will find inspiring love sayings for your girlfriend or wife, that will make her smile all day! I will always love you like we are back in 1982. I don’t need sleep when I have you, my lovely Energizer bunny. I didn’t know what love was until I met you. I asked the universe for love and it brought me to you. You are beautiful and love is beautiful, so you are love. I love you so much that I want to see you every day for the rest of my life. When I’m standing outside in the cold waiting to cross the street I try to use memories of your love to warm me up. Your love is so wonderful that Cupid visits every day just to see it over and over. Love is how you always appear right on time to drag me on an adventure when I think I’m going to have a boring day. The Earth grew Tulips and Roses, but the Universe grew you. I love you so much that whenever you need a reminder and you’re crunched for time, you only have to read the first three words of this sentence. I met someone once and I will love her forever. I know you are my Earth angel because you have brought my life nothing but love. A shooting star fell from the sky one day while I was standing on my balcony and here we are today. You make our dates go by too fast with your love. I got my dog a companion so he will understand how I feel about you. Love looks like you completely dressed sitting on a seat across from me at a table anywhere on Earth. Your love is enough to keep my bones strong and my wallet empty. I self-prescribed myself a daily dose of our conversations. When I met you, everything made sense, my love.